A Kubeflow pipeline component is an implementation of a pipeline task. A component is a step in the workflow. Each task takes one or more artifacts as input and may produce one or more artifacts as output. Client code: The code that talks to endpoints to submit jobs. 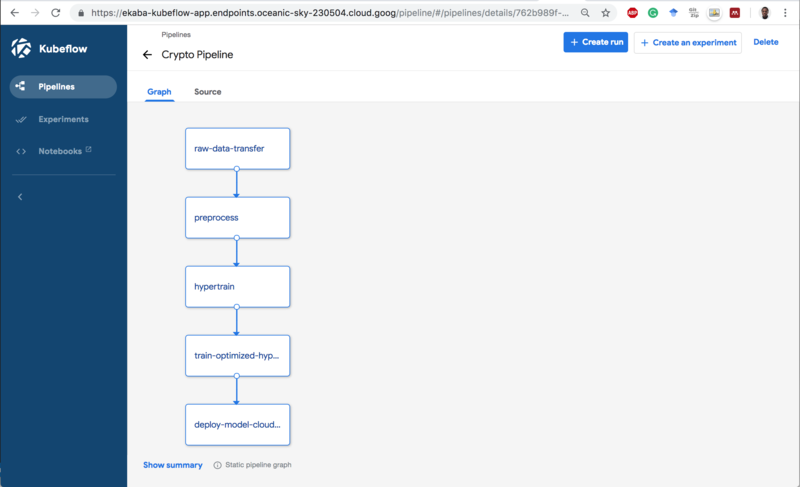 For example, code to connect with the Google Cloud Machine Learning Engine. Runtime code: The code that does the actual job and usually runs in the cluster. For example, the code that prepares the model for training on Cloud MLE. A component consists of an interface (inputs/outputs), the implementation (a Docker container image and command-line arguments) and metadata (name, description). In this simple example, we will implement a deep neural regressor network to predict the closing prices of bitcoin cryptocurrency. The machine learning code itself is pretty basic as it is not the focus of this article. The goal here is to orchestrate a machine learning engineering solution using microservice architectures on Kubernetes with Kubeflow Pipelines. Move raw data hosted on Github to a storage bucket. 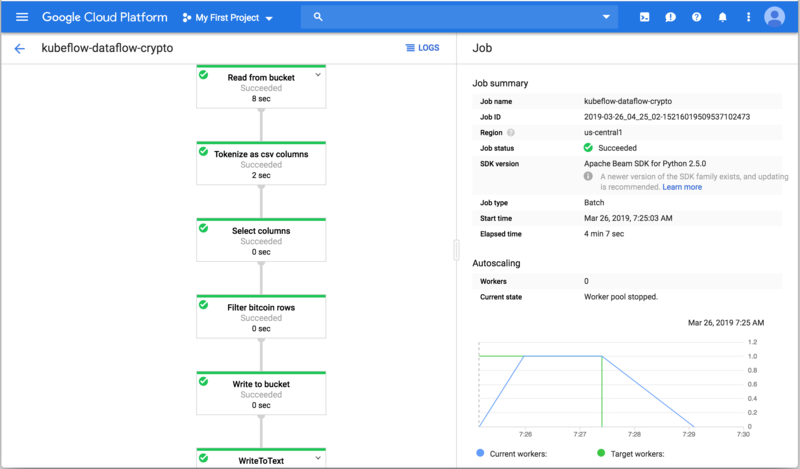 Transform the dataset using Google Dataflow. Carry-out hyper-parameter training on Cloud Machine Learning Engine. Train the model with the optimized hyper-parameters. Deploy the model for serving on Cloud MLE. __ Dockerfile : Dockerfile to build the Docker image. __ build.sh : Script to initiate the container build and upload to Google Container Registry. 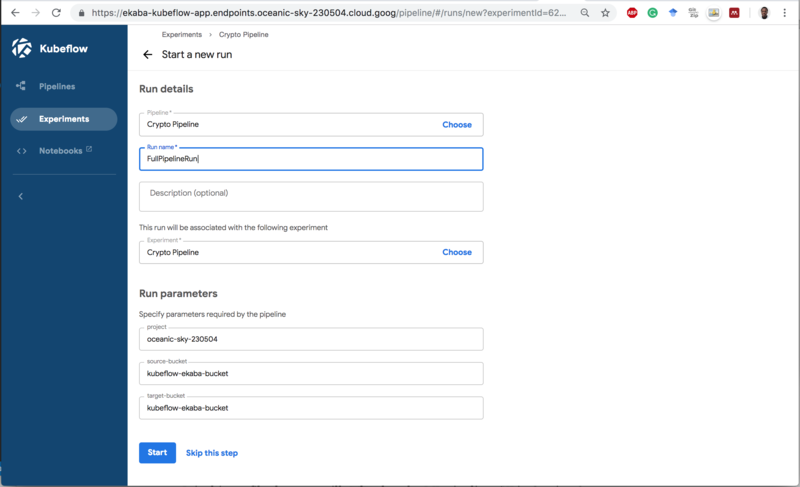 __ dataflow_transform.py : Code to run the beam pipeline on Cloud Dataflow. __ service_account.json : Secure key to authenticate container on GCP. __ local_test.sh : Script to run the image pipeline component locally. 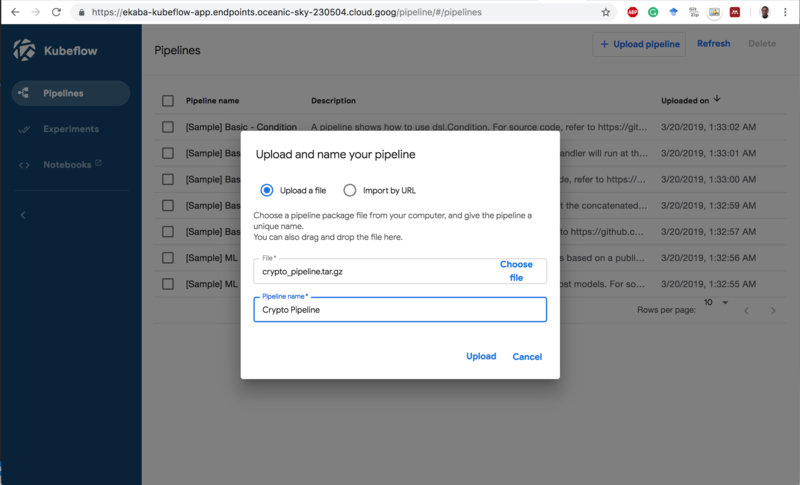 Before uploading the pipeline to Kubeflow Pipelines, be sure to build the component containers so that the latest version of the code is packaged and uploaded as images to the container registry. The code provides a handy bash script to build all containers. The pipeline code contains a specification on how the components interact with one another. Each component has an output that serves as an input to the next component in the pipeline. 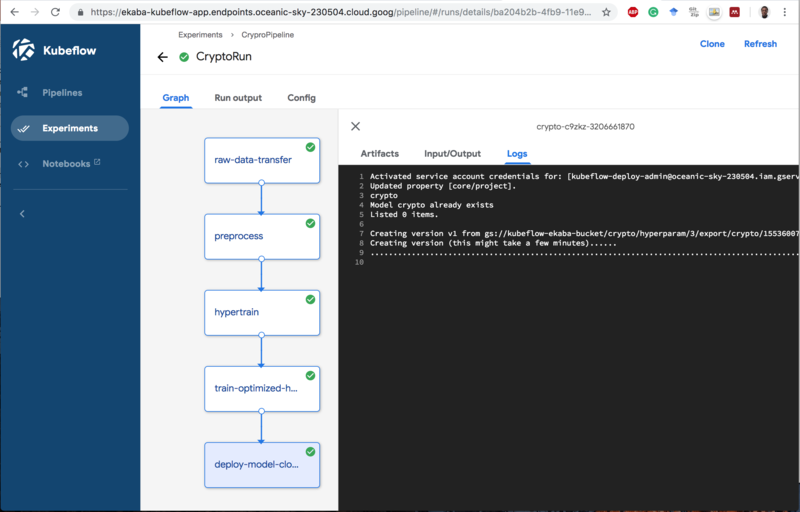 The Kubeflow pipeline DSL language dsl-compile from the Kubeflow Pipelines SDK is used to compile the pipeline code in Python for upload to Kubeflow Pipelines. 1 Upload the pipeline to Kubeflow Pipelines. 2 Click on the pipeline to see the static graph of the flow. 3 Create an Experiment and Run to execute the pipeline. The following resources are helpful for creating and deploying a Kubeflow Pipeline.